Well, fall has definitely made its presence known at my house in more ways than one. We all are a bit stuffy in the nose, causing a whirl-wind wipe-down extravaganza. Cleaning really isn’t my thing, but it sure is beneficial when you have a child that puts everything in her mouth. Everything. So, the other day after spending a couple of hours sanitizing the bathrooms and most of the other areas of our home, I noticed some really beautiful fall colors peaking through my newly washed windows. Living in California, you don’t get much of a big change of seasons, but we have a monster of an oak tree,which makes our little corner of the world seem full of fall. 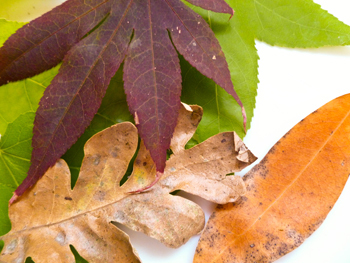 I headed outside, while the babe was still napping, and collected a few of those fallen leaves and a couple that were still barely hanging on. I figured we could enjoy a fun fall art project once she awoke from her beauty sleep. My daughter is still a bit young to get the hang of doing leaf rubbings, but she sure knows her way around a paintbrush. I decided to help her out with this festive fall project by starting the first part myself. I picked out the red, yellow, and orange crayons and positioned a few leaves under a sheet of white paper, then gave the whole thing a good rub down using the side of the crayon. The wonderful pattern of the leaves colorfully shined through. 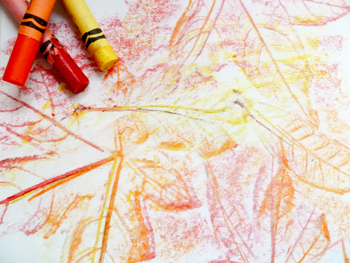 Your child could also use a white or black crayon to see how his artwork would be different. Hey, he can use whatever colors he wants – as long as he’s having a good time! Using the side of the crayon to rub against the paper encourages your child’s fine motor skills, and helps develop all those itty-bitty muscles in his hands. Once the babe was awake, I strapped her in her trusty high chair (that’s pretty much only used for art projects these days) and got her ready for some painting. You see, crayons are oil based, which repel water. When your wee tot paints over that crayon rubbed paper, those details from the fall leaves will pop right through! You can encourage your child to pick colors to paint over the leaves that he sees around him, such as red, yellow, or orange. This way his finished leaf painting will really look like those fall leaves out in the yard. My daughter so enjoyed painting over the fall leaf crayon rubbing with her paintbrush that she even used some of the leaves, too! Hey, why not, right? 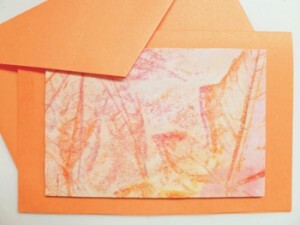 And, you just KNOW how much I love to make cards! This was a perfect creation to be the front of a fall card to fill with pictures and send off to great-grandma.